Enhanced forward visibility is provided by the glazed A pillars and additional glazing to the front panel. 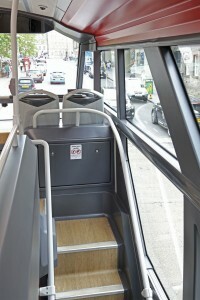 The front seat passengers’ individual screens for the oblecto system from v6e are mounted on the waistrail as is the camera to provide a live forward view to downstairs passengers. Tourism is a major business for Edinburgh with around 4m visitors every year pumping over £3.2bn into the city’s economy. 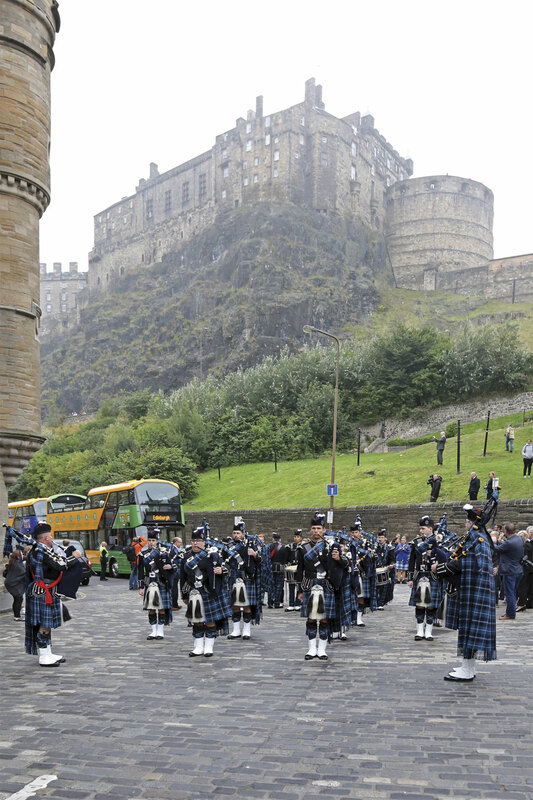 That the bus and coach industry is a significant contributor to this was made clear when Lothian Buses MD, Richard Hall, welcomed guests to the recent launch of Edinburgh Bus Tours new £6.5m vehicle fleet in the city’s Grassmarket with the famous castle towering above in the mist. Referring to the 30 new vehicles about to be unveiled, Richard said, ‘We pride ourselves on operating one of the most modern and cleanest fleets in the UK. 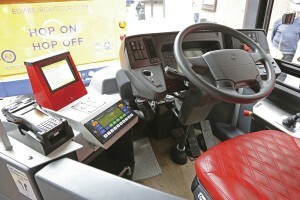 By developing a close working partnership with Wrightbus and Volvo these new vehicles have been designed and built to our exacting specifications to ensure that we continue to exceed the expectations of our tour passengers.’ The new vehicles also support Lothian Buses’ fleet strategy of a 42% cut in its carbon footprint by 2020, reducing CO2 emissions by 40% compared to the existing tour vehicles and cutting both NOx and particulates by 95-99%. This will deliver a significant impact to the air quality locally in central Edinburgh where sightseeing buses form a significant proportion of the traffic in a number of narrow building lined streets. Richard invited guests to join him on the west side of Grassmarket ready to ‘sit back and relax as we take you on an amazing journey.’ Soon the sound of pipes and drums heralded the arrival of the band from the Royal Edinburgh Military Tattoo followed by three of the new buses showcasing the colours of the three tours on which the fleet will be used (The Edinburgh Tour – green, The Majestic Tour – blue and City Sightseeing – red). 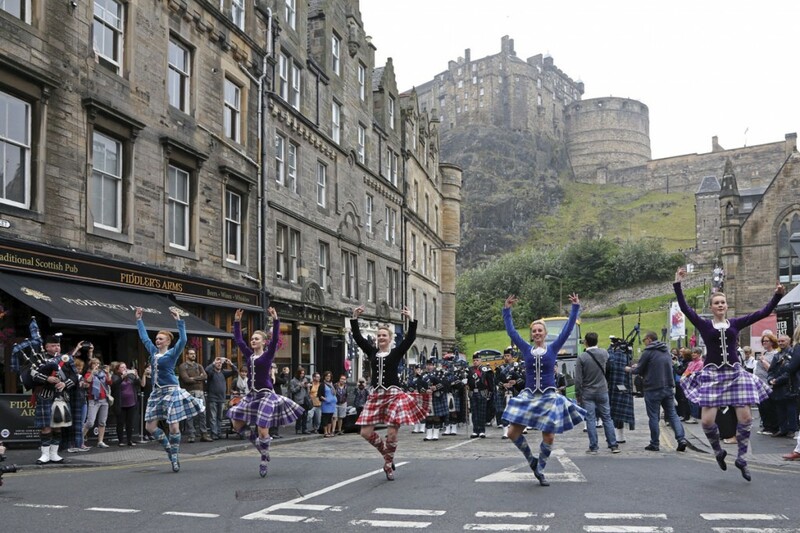 With it being festival season in Edinburgh, the message that there was entertainment in the Grassmarket soon spread amongst tourists and the area quickly filled with people enjoying the band and accompanying dancers. The local police were very supportive in holding back traffic during the short performance and subsequent parallel drive of the buses along the south of the square. Guests then joined their allocated vehicle for a short demonstration tour, fortunately the weather remained dry if somewhat grey and there were seats in the open air for all those keen on sampling the fresh air experience. Based on an extended Volvo B5TL chassis, the 11.5m buses feature Volvo’s D5K 240 four cylinder 5.1 litre Euro6 engine rated at 240hp with maximum torque of 918Nm at 1200-1600rpm. Engine emission control uses SCR, EGR, DPF and DOC technology. Additional green credibility comes from the neutral bus stop feature of the ZF Ecolife 6AP1003 B six-speed automatic gearbox. They have a ZF drop centre portal rear axle and ZF hydraulically assisted power steering together with electronically controlled air suspension incorporating a kneeling facility on the beam front axle. 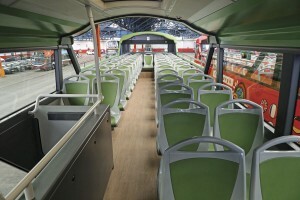 Wrightbus have re-engineered the Gemini 3 body structure to meet Lothian Buses’ requirements. The principle challenges were the design of the ends of the open section to support structural integrity and the provision of top deck drainage. The former was achieved by the incorporation of two structural hoops angled to match the existing staircase line of the Gemini 3 body. These intrude slightly into the upper deck headroom and are padded on the inside for the benefit of the tallest passengers. The drainage requirement has been met by channels running the length of the vehicle on either side which are covered with a metal grating that sits harmoniously alongside the wood effect floor covering. Four down pipes within the body pillars take the rainwater for release at road level. Alongside these engineering challenges, the exterior appearance has been subtly changed with the incorporation of glazing into the wide A pillars together with an additional glazed panel below the front upper deck windscreen as limited (amber coloured LED) destination display equipment is required on the vehicles. The staircase is fully glazed and there are glazed roof panels in the covered upper deck area, both items sharing commonality with the most recent deliveries of closed top buses to Lothian Buses. 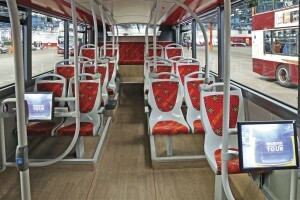 The single door vehicles have a potential total capacity of 89 including standees with two dedicated wheelchair spaces. Seating is individual moulded weatherproof Fainsa Metropolis units from Compin with E-Leather inserts matched to the vehicle’s external colour scheme. The seatbacks are fitted with a headphone connection and screen for the oblecto (from the Latin for ‘to entertain or amuse’) multi lingual touch screen commentary system from v6e. The 11.5m length normally allows for 53 seats with underseat lighting on the upper deck, 16 of them fully within the roofed area. In the case of the green vehicles for the Edinburgh Tour, the front nearside seat pair is replaced by a single rearward facing high specification seat for the tour guide. The lower deck has 17 individual seats, all but the first five on podests plus a fully trimmed seat for five across the rear with the emergency exit in front of it on the offside. A full CCTV system is installed including a forward facing camera mounted on the front upper deck screen handrail which feeds live footage to screens on the lower deck including dedicated screens for each wheelchair position. 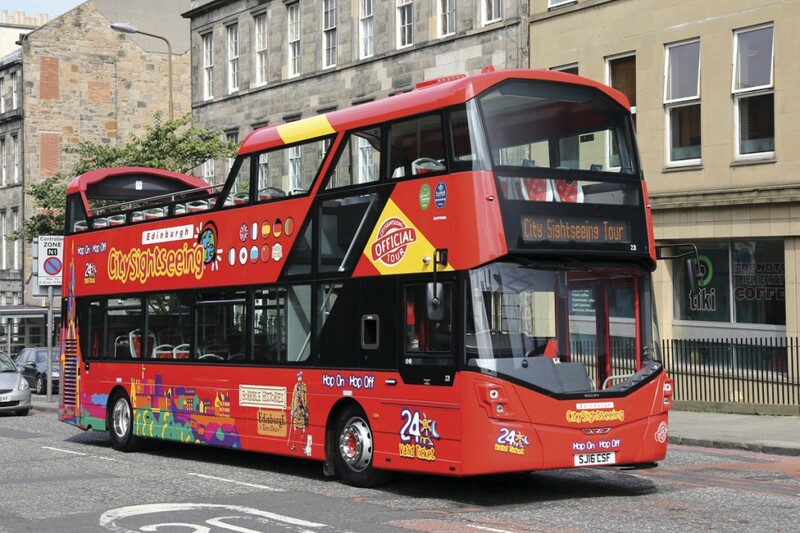 The Edinburgh Bus Tours operation of Lothian Buses will use the new vehicles to upgrade the three of the five tours in its portfolio that operate on a year round hop on-hop off basis with summer departure frequencies up to every ten minutes. 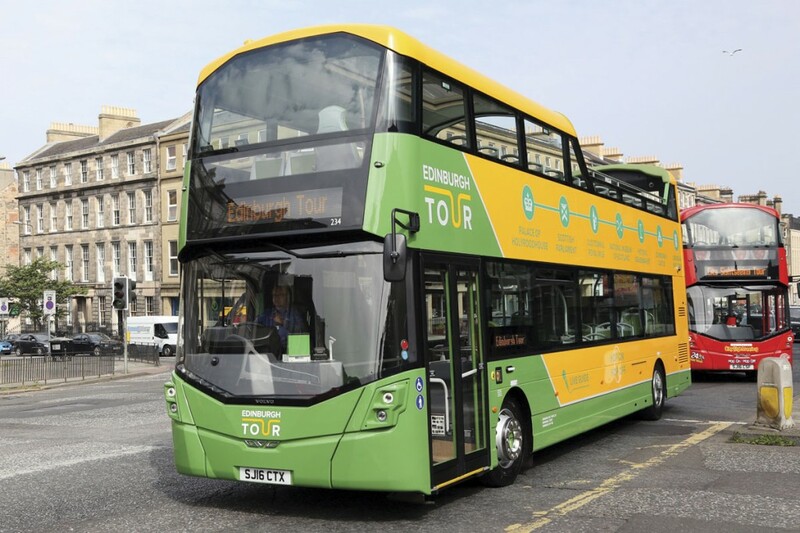 The Edinburgh Tour covering the old and new towns with a live commentary in English will receive the green vehicles with upper deck seat for the tour guide. The red vehicles are for the City Sightseeing tour which covers a similar area on a different routing. This offers a pre-recorded commentary in nine languages plus an alternative ‘horrible histories’ commentary popular with younger participants. 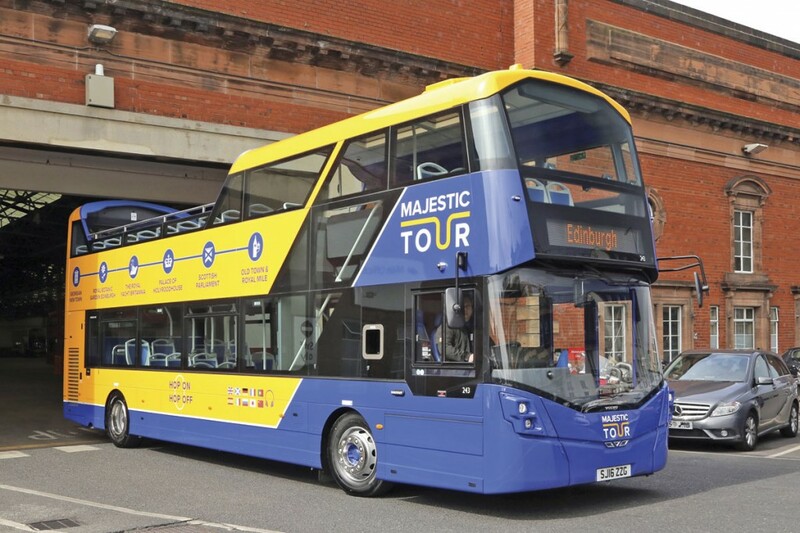 The Majestic Tour with the blue vehicles and pre-recorded commentary covers a wider area to take in the popular Botanic Gardens, Royal Yacht Britannia and Leith destinations. 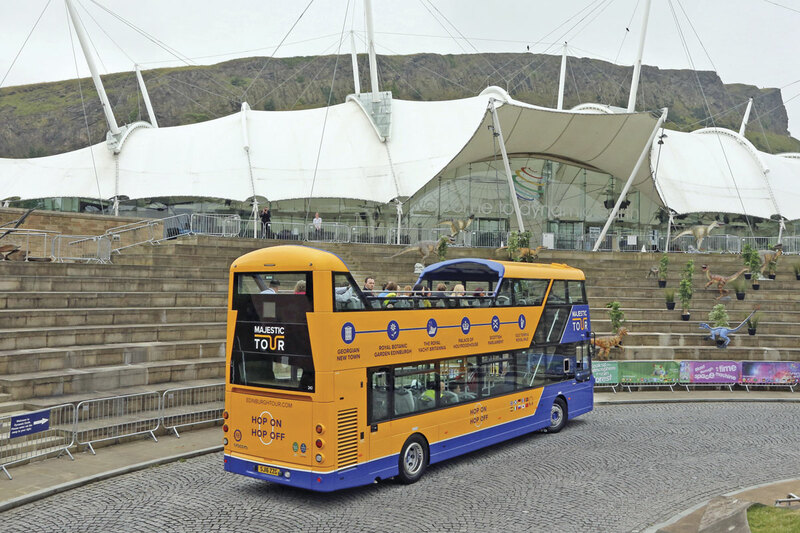 The other two tours in Edinburgh Bus Tours’ portfolio operate on a summer seasonal basis up to October. 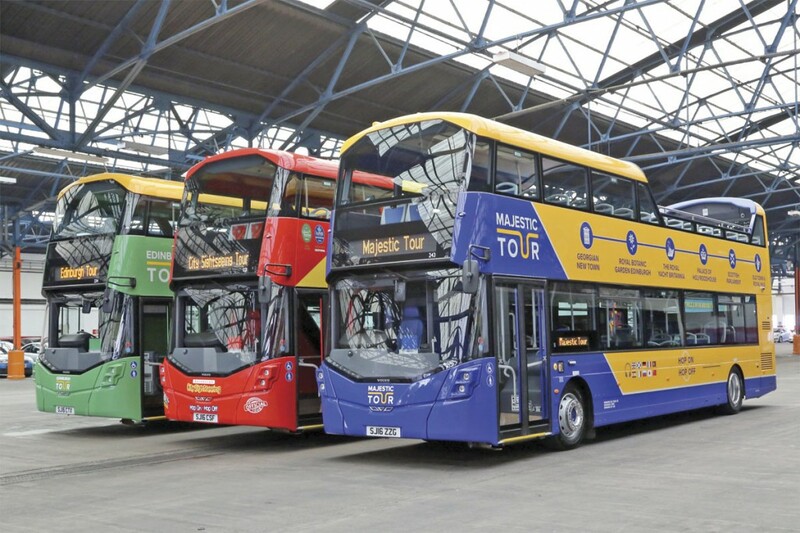 The MacTours route takes in parts of the old and new towns with a live commentary in English given on the upgraded and extended vintage Routemaster buses that first entered service in London over 50 years ago. The Bus and Boat Tour with covered top vehicles takes the visitor through the new town to Queensferry for a boat cruise around the bridges and Inchcolm Island. The tours are the third most popular paid for tourist attraction in Scotland (after Edinburgh Castle and Edinburgh Zoo) and contribute significantly to the economy of the city resulting in their recognition with an ‘exceptional’ five star award from the Scottish Tourist Board. 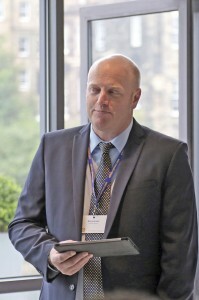 Working in support of Lothian Buses’ environmental policy and serving attractions en route with noted green credentials has also resulted in the company receiving a Green Tourism gold award, a position which will be further strengthened by the introduction of the new low emission vehicles. 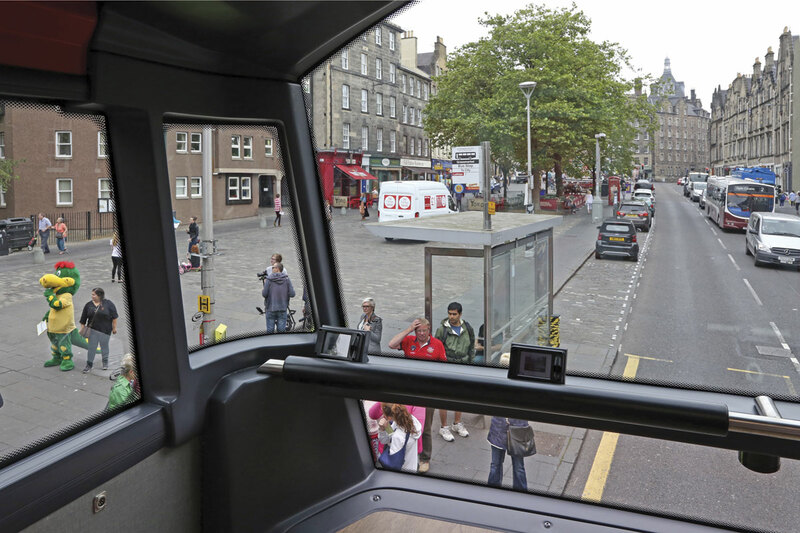 As part of the new vehicle launch, participants were able to experience the new vehicles with live commentary over an abbreviated Edinburgh Tour route. Designed to cope with vagueness of the Edinburgh weather, the seating was firm but suitably comfortable and the ride smooth given the less than perfect condition of some of the city’s roads. The guide was very knowledgeable, interspacing the traditional historical and often gruesome facts with more up to date material covering a wide range of interests and practical tips like being wary of the pigeons should a train pass over the bridge near Holyrood House. The first vehicles are expected to enter service in September with the full fleet available for the 2017 summer season. One of them is expected to appear at Euro Bus Expo in November, on the Volvo Bus stand carrying a distinctive special livery. 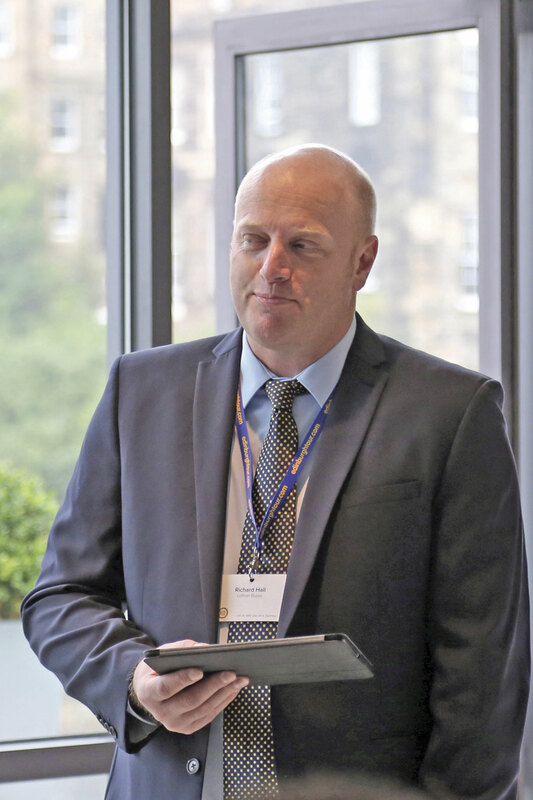 The development work undertaken by Wrightbus in conjunction with Lothian Buses and Volvo Bus will flow through into the company’s wider portfolio. The open top body will initially be offered generally at 11.5m on Volvo chassis and could be available at the same length using the in house Streetdeck chassis. Alternative lengths are not currently planned unless a significant order justified the structural design work involved. A popular choice is likely to be the glazed A pillar which will be offered on both Gemini 3DL and Streetdeck bodies. 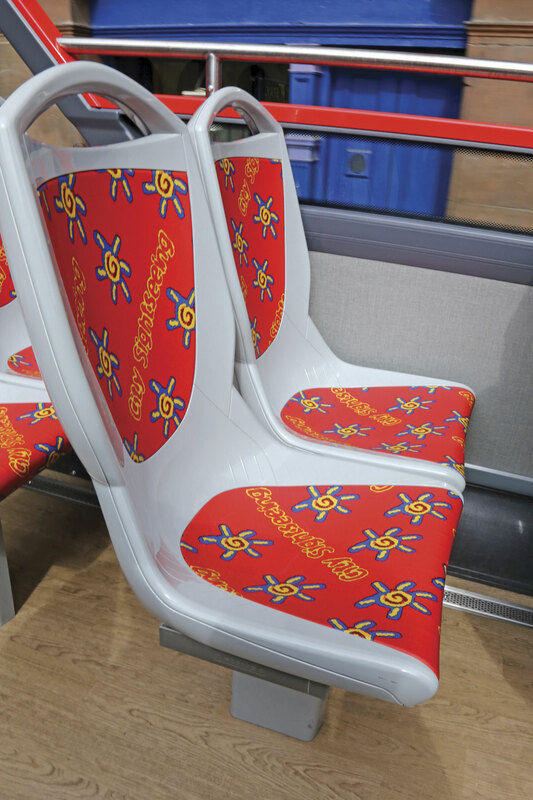 The first covered top vehicle order to encompass this enhancement has already been placed by Lothian Buses for Volvo B5TLs due in 2017.